Summary: Rhett Miller, who apparently is a famous enough singer and songwriter to be in Wikipedia, has created a collection of 23 poems on such kid-friendly topics as dogs, homework, baseball, and how to use karate to flush a toilet in a public restroom. 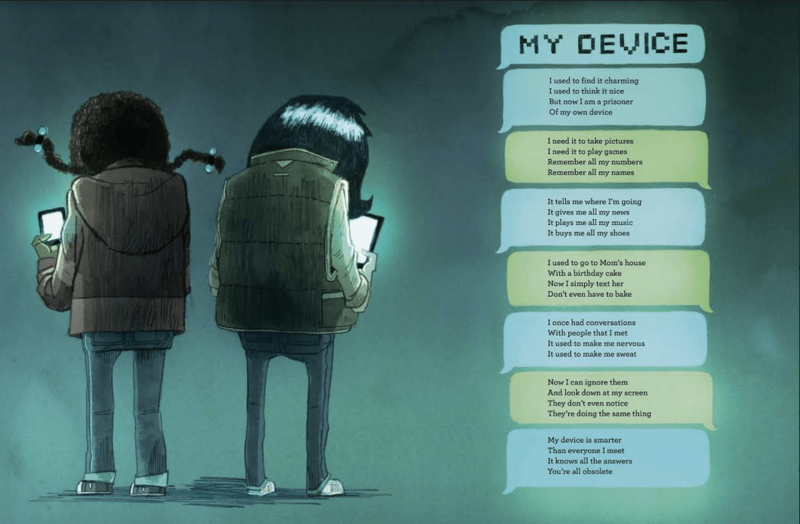 Each poem is accompanied by a Dan Santat illustration; some include the poem as part of the picture, such as “My Device” which is written like a series of texts. Includes an author’s note at the beginning explaining his use of punctuation (or lack of). 48 pages; grades 2-5. Pros: Fans of Jack Prelutsky and Shel Silverstein will love this colorful collection that includes just enough bathroom humor (“3:00 AM Pee”) and gross themes (“Hairs”, “Stinky-Mouth You”) to keep any elementary kid happy. 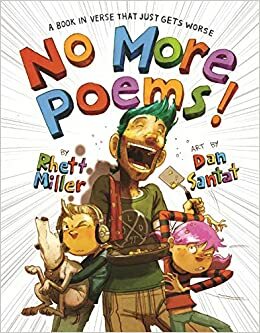 The poetry perfectly captures kids’ voices (“My dad is a rock star/And I’m just like whatever” begins the jaded kid narrator of “Rock Star Dad”), and the illustrations provide the perfect complementary comic touches. Cons: “Brotherly Love” gets a little dark for the younger elementary crowd.